The late Dr. Abram Kanof would have loved art historian Adam Cohen’s new collection of visually significant Haggadot from the past 700 years, Signs and Wonders: 100 Haggada Masterpieces. Kanof was a pediatrician by profession, but a passionate devotee of Jewish art as his avocation, single-handedly opening the first permanent Judaica collection in a public art museum at the North Carolina Museum of Art in the 1970’s, as well as contributing to the Duke University Library and donating much of his Judaica collection there. Kanof was also my friend at the end of his long life and I was thrilled to see that one of the many collections Cohen consulted in America, Canada and Israel was the Abram and Frances Pascher Kanof Collection of Jewish Art, Archaeology, and Symbolism at Duke. Having the visual repertoire of the array of Jewish civilization available to all to admire and learn from was Kanof’s raison d’etre. Cohen’s new volume provides this exceptionally well. 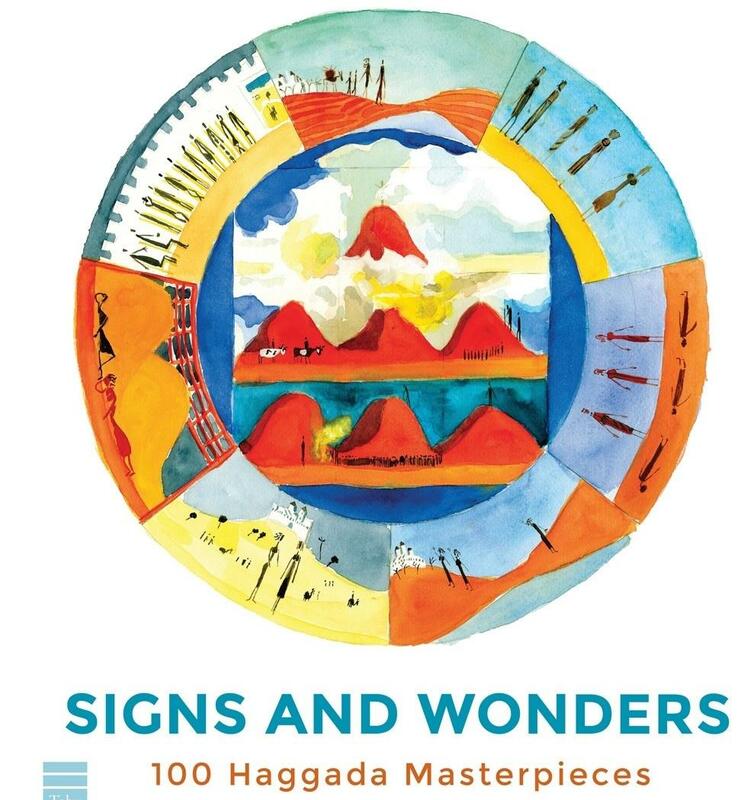 Signs and Wonders: 100 Haggada Masterpieces is a book meant to teach both those who don’t know much about the varieties of Jewish art and those who want to learn what a seder is about and its significance by looking at 100 masterworks from an assortment of years and also for those, like me, who try to buy a new Haggadah each year to get a different take on the holiday. Though the magisterial volume by my late teacher Yosef Yerushalmi, Haggadah and History, still has its importance, Cohen’s volume provides a guide as to how to interpret the visual imagery on the pages of the many haggadot surveyed. As Cohen explains in his introduction to the volume, the illustrations of the Haggada “serve as interpretations to the seder in particular and to Jewish history in general.” The reasons for artists to decorate the pages of the text for the seder night were varied. Cohen hypothesizes that among them were “to increase the value of the book or make it appropriate as a gift; to demonstrate the status of the owner or the recipient; or to enhance the seder experience visually and intellectually by illustrating the text.” His criteria for selection were that he was able to see the whole haggadah to make a selection from it, that he found it visually enticing, and that it is part of a larger tradition of illustrated haggadot. Cohen was kind enough to provide the Wisdom Daily with a few examples of the works he has chosen for the volume. We often think of much of Jewish life as being based on words but in fact, particularly on Passover, all our senses are involved in creating the holiday, with the music and the food being large components, as well as the toil to clean for it that our entire bodies must undergo. But a book like Signs and Wonders shows that understanding why a story needs visuals is central to our telling – and seeing – of the story of the Exodus.